First line: "No one really knows 'bout me." In this re-telling of the Robin Hood tale, Will Scarlet has been re-cast as a girl. She is, of course, a tomboy, who frequently masquerades as a young lad. 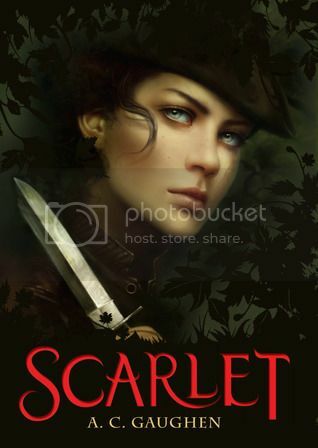 Scarlet is a grumpy loner, who can't seem to figure out how to fend off Little John's advances and admit her feelings for Robin Hood - to herself, or to him. I found the dialect a bit of an annoying distraction, but I got used to it fairly quickly. Imagine a Cockney-accented Katniss, and you'll have an idea of what Scarlet is like. As tough as Scarlet is, I wish that she had been able to get Little John out of the picture a little faster... she's oddly passive when he shows interest. There are also some terribly awkward scenes when a young woman has a crush on Scarlet, not realizing Scarlet's true identity. There is a great twist at the end, and I liked the treatment of Maid Marian. The medieval England setting is rustic and there are plenty of hardscrabble characters just barely eking by. Still, the grittiness of the story is not overwhelming, and for romance or violence, the book is relatively tame.